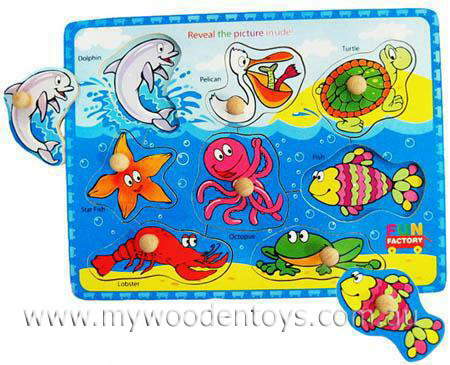 Knob Wooden Puzzle Sea Creatures is a bright, happy puzzle filled with splashing sea animals. This wooden puzzle contains 8 shapes with knobs to make them easy to manipulate for small hands and fingers. Your little one will have fun learning all the names of these Sea Creatures.... Octopus, Pelican (with a beak full of fish) star Fish are just a few and fitting them into the pretty base board is a fun challenge. We like this because: "a big pink happy smiling octopus is always a good thing."